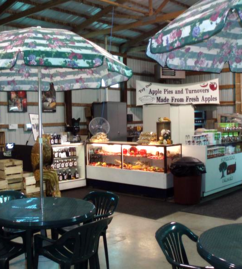 Our assortment of apples changes weekly as the apples ripen, so be sure to come in and sample them all. We have pumpkins, nine different types of squash, and over 10 different types of gourds. View our free chrysanthemum show with over 100 plots of chrysanthemums. Step inside for tasty samples and free coffee. Browse through our selection of bakery items, jams, honey, cider, syrups, caramel, and even dried plants for flower arrangements. Check out the picnic area to the side of the orchard.